Our Saturday working day this week saw considerable activity and a healthy turn-out of willing volunteers. Whilst we sat in the Apedale Heritage Centre at lunchtime consuming tea and oatcakes (the staple diet in these parts), our Chairman Phil showed us part of a DVD he is preparing showing the final days at our former Cheadle Hulme site and the early progress in constructing the railway at Apedale. It is now nearly ten years since we vacated Cheadle and it seems longer! 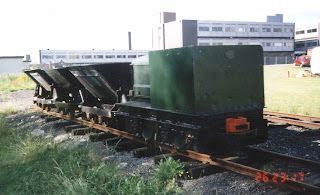 The video (see photos) showed the final open day with a good variety of rolling stock on show, followed by some shots of track recovery using the former Ashton-under-Lyne Sewage Works Hudson locomotive “Chaumont”. The DVD will be available to buy later in the year. 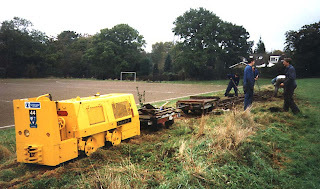 Dismantling a railway and “putting it back in its box” (as Phil explained to a young passer-by at the time) is much easier than building it again. Anyone who has ever been involved in restoring anything will know that the easy (and cheap) bit is dismantling it. However by far the most rewarding part is putting it all back together. This is how it feels at Apedale now. Virtually every week there is visible progress on the site, the buildings and the railway and the stage is now set for another major project to commence in the next couple of weeks. We are about to start erecting a brand new storage building that will house the ex-Cheadle locomotive collection, allowing these engines to see the light of day once more. We are looking forward to being able to show off the entire collection again and with that in mind we are making plans for a railway open day later in the year. The passenger line won’t be ready by then but that won’t stop us putting on a good show – we’re itching to crank-up a few engines that haven’t been run since they left Cheadle. If you’ve got some time on your hands and fancy getting involved, pop down to Apedale on any Saturday and join in the fun. It’s hard work but it’s rewarding and there’s plenty still to do. Membership details can be found here.